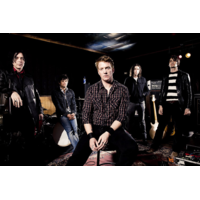 Queens of the Stone Age is an American hard rock band from Palm Desert, California, United States, formed in 1997. Since its inception, the band's line-up has included founding member Josh Homme (lead vocals, guitar), with its current line-up including longtime members Troy Van Leeuwen (guitar, lap steel, backing vocals) and Joey Castillo (drums, percussion), alongside Michael Shuman (bass guitar, backing vocals) and Dean Fertita (keyboards, guitar). Formed after the demise of Homme's previous band, Kyuss, Queens of the Stone Age developed a style of riff-oriented, heavy music. Their sound has since evolved to incorporate a variety of different styles and influences, including working with ZZ Top member Billy Gibbons and steady contributor Mark Lanegan, both of whom have contributed influences from genres such as blues and grunge.